Serge Jonas Ibaka Ngobila was born on the 18th September 1989, in Brazzaville, Republic of the Congo. He is known for being a Congolese-Spanish professional basketball player, who now plays in the National Basketball Association (NBA) for the Orlando Magic. His professional playing career has been active since 2007. Have you ever wondered how rich Serge Ibaka is, as of mid- 2016? According to authoritative sources, it has been estimated that the total size of Ibaka’s net worth is over $12 million, which has been accumulated through his successful involvement in the sports industry as a professional basketball player. Serge Ibaka was raised the third-youngest of 17 siblings born to parents who were both professional basketball players. His mother Amadou Djonga was a player in the Democratic Republic of Congo, while his father Desiree played for the Congolese national team. So, he was introduced to the sport from an early age, and began playing for the Avenir du Rail team. When he was 17 years old, Ibaka moved to France, and later to Spain, where he played with the second division basketball club CB L’Hospitalet. While at the club he was spotted by NBA scouts, and on their suggestion Serge decided to enter the 2008 NBA Draft, being selected as the 24th overall pick by the Seattle SuperSonics, however, the club was then moved to Oklahoma, and he became a part of the Oklahoma City Thunder. However, Serge decided to stay in Spain, signing a contract with Ricoh Manresa, but the following year he moved to the NBA. 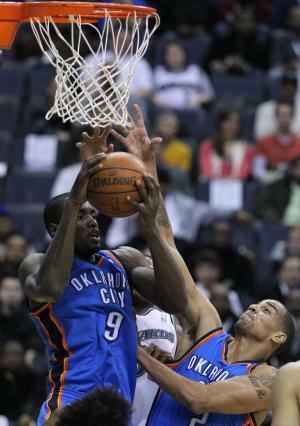 In his first season, Serge played in 73 games, and averaged 6.3 points, 1.3 blocks, and 5.4 rebounds per game. Since then, his numbers have been in constant rise; in 2011-2012 he had 3.7 blocks per game, and was named as NBA Blocks leader, and also the following season, in which he had 3.0 blocks per game, then in 2013-2014 season, Serge averaged 15.1 points, 2.7 blocks, and 8.8 rebounds. His net worth increased by a large margin, as in 2012 he signed a contract worth $48 million over four years. Serge continued with great performances, and in 2014-2015 he averaged 14.3, 2.4 blocks, and 7.8 rebounds in the 64 games he played. The following season was his last in Oklahoma, as he was traded to the Orlando Magic, for Ersan Illyasova, Victor Oladipo, and draft rights to a first round pick, Domantas Sabonis in the 2016 NBA Draft. Apart from his successful career on a club level, he has also contributed to international basketball, playing for Spain. Serge was a part of the national team that won the gold medal in 2011 in FIBA European Championship held in Lithuania, and silver medal at the Olympic Games in London held the following year. When it comes to speak about his personal life, Serge Ibaka is the father of a daughter, who was born when he was still in his teens. He is known as a polyglot, as he speaks four languages – Spanish, English, French and Lingala.